Sony has been hacked again, the electronics company isn’t doing so good. After the first attack that brought the Sony PlayStation Network down for an extended amount of time, Sony admitted that hackers broke into the servers during April 16 and 17 when personal information may have been stolen, we learn now the company was hacked again. The attack this time targeted the Sony Online Entertainment users, according to Sony hackers may have stolen personal data from 24.6 million accounts, including some outdated data from 2007 Sony was keeping. The database contains over 12,000 non-U.S. credit cards with expiration, thankfully security codes weren’t taken. It was also reported that over 10,000 direct debit accounts were stolen from that contained customers from Austria, Germany, the Netherlands and Spain. Like with the earlier attacks personal data such as name, address, email address, birth date, gender, phone number, login name and hashed password were said to be taken. The direct debit accounts records stolen include bank account number, customer name, account name and customer address. 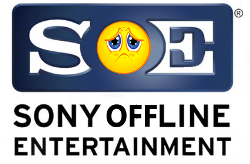 Fearing that more information might be stolen, Sony has taken down all Sony Online Entertainment servers related to the service. Sony one again apologized for the attack and promised to send emails to users whose data may have been stolen in the attack. Sony also promises users that it will compensate customers every day the service is down and grant them 30 days of extra time on subscriptions. This is strike two for Sony, if they have been hacked twice now are they becoming a less reputable company?